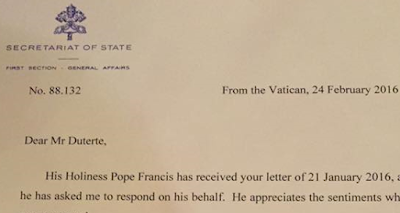 In a letter dated 24 February 2016, the Vatican Secretariat of State, through Archbishop Giovanni Angelo Cardinal Becciu, sent a letter saying that Pope Francis appreciates Duterte's sentiments. The Italian cleric Becciu is the Vatican City's Substitute for General Affairs [NCROnline]. He is responsible for handling matters regarding the everyday service of the Pope [Vatican]. Vatican's letter invoking divine blessings of wisdom and peace to Mr. Duterte. 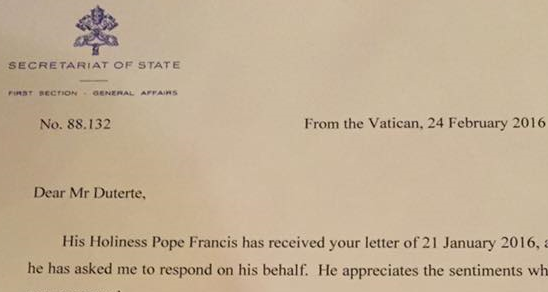 His Holiness Pope Francis received your letter 21 January 2016, and he has asked me to respond on his behalf. He appreciates the sentiments which you expressed. The Holy Father offers the assurance of his prayers for you, as he invokes upon you the divine blessings of wisdom and peace. And here's the video of Archbishop Romulo Geolina Valles, D.D. reading the letter from the Vatican invoking divine blessings of wisdom and peace to Mr. Duterte.. In a November 2015 speech, Duterte cursed at the pope on national TV. Duterte subsequently said he had no intentions of insulting the pope and the his anger was directed at Manila's traffic situation. Regardless, the mayor received criticisms from both his opponents and the general public.